I was unprepared as to how many of you all liked them! I too love them so much so, I made another video…! BUT at the moment they are on sale and Cost only £22.00 BARGAIN! Come in extra wide sizes and are available in sizes 4 5 6 7 8 and 9. Get them for spring before they go! Shop for them below by clicking the pics or clicking the links above. They come up true to size but I wear them with socks so they are a little tight, but are stretching nicely. I wore the pink ones in the rain, got home and dried them off, gave them a brush and they were good to go. Not suede but for £22.50 an absolute bargain and I get compliments wherever I go. Buy them now at that price they are selling fast! I hope you are having a happy week? I was Lucky to be gifted these boots from JD Williams A company I admire, I would not hesitate to buy these boots myself and therefore am happy to recommend them to you. All words and opinions are my own! Ashley, I can totally see why you received lots of comments and questions about these boots. They are so fabulous! 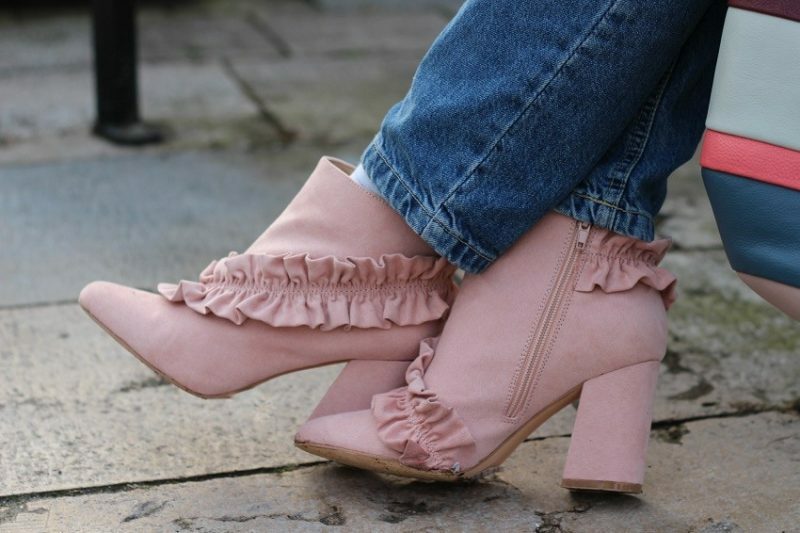 Pink and frilly, I mean, you can’t go wrong! Just beautiful. Life is short, buy the boots! Thank you Shelbee and oh my haven’t you been a busy bee lately! Those are amazing…..I’m such a shoe girl that any new shoes make me smile!!! I’m with ya all the way! The best thing is they go with everything! They are great for spring! And they look great on anything in my mind! Thank you Nancy I thik you have excellent taste!